A new discovery promises to help physicians identify patients most likely to benefit from breast cancer drug therapies. If the compound, called "Nanobody", proves effective in clinical trials, it would represent a significant advance for breast cancer drug therapy because some drugs are effective only in some people. As part of the Department of Energy's SunShot Initiative, Energy Secretary Steven Chu announced nearly $170 million in available funding over three years to support a range of solar photovoltaic (PV) technology areas. A University of Houston engineering researcher is trying to bring color to the black-and-white world of magnetic resonance imaging to make MRIs easier to read. In a development that holds intriguing possibilities for the future of industrial catalysis, as well as for such promising clean green energy technologies as artificial photosynthesis, researchers with the Lawrence Berkeley National Laboratory (Berkeley Lab) have created bilayered nanocrystals of ametal-metal oxide that are the first to feature multiple catalytic sites on nanocrystal interfaces. These multiple catalytic sites allow for multiple, sequential catalytic reactions to be carried out selectively and in tandem. Two interlocking rings of DNA are only visible through the scanning force microscope. When a forensic agent dusts a surface with powder or exposes it to the vapors of an iodine chamber, mystery fans know what is going on: This is how latent fingerprints are made visible so that they can be compared to those of a suspect. 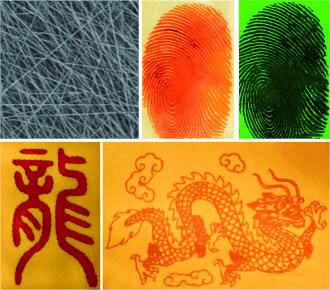 Scientists have now developed a new process for especially rapid and simple detection of fingerprints. All it takes is a special nanofiber mat that is pressed onto the suspect surface and briefly treated with hot air - the fingerprints appear as red ridge patterns. CEA-Leti today announced a new project designed to develop a novel nanocarrier-based approach to improve the treatment of inflammatory bowel disease, and increasingly common condition in Europe. Kuenftig laesst sich vielleicht schon mit einer einzigen Solarzelle etwas anfangen. Forscher des Max-Planck-Instituts fuer Mikrostrukturphysik haben naemlich einen Effekt entdeckt, aufgrund dessen ein fotovoltaisches Element aus Bismutferrit eine Spannung von bis zu 40 Volt und nennenswerte Stromdichten liefert. Researchers at the University of Sheffield have discovered a new way of making small molecules self-assemble into complex nanopatterns, which will push the limits of what is possible in 'bottom-up' methods of nanopatterning for advanced functional materials through molecular self-assembly. 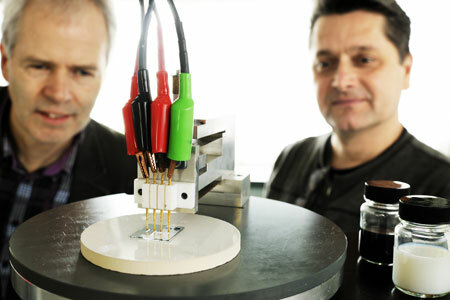 Researchers at Eindhoven University of Technology have developed a replacement for indium tin oxide (ITO), an important material used in displays for all kinds of everyday products such as TVs, telephones and laptops, as well as in solar cells. Unfortunately indium is a rare metal, and the available supplies are expected to be virtually exhausted within as little as ten years. The replacement material is a transparent, conducting film produced in water, and based on electrically conducting carbon nanotubes and plastic nanoparticles. It is made of commonly available materials, and on top of that is also environment-friendly. Using a special reactor inside a clean room, researchers apply nanometer thick films of aluminum oxide to a sample silver wafer about the size of a silver dollar. The films conform to the recesses and protrusions of the silver, creating a protective barrier. Science and technology meet art: Nano images, taken directly from the labs of German research institutions, will be on view at the German Center for Research and Innovation (GCRI) from April 13 until June 10. The NanoCode Synthesis Report on its Stakeholder CoC Survey (pdf) provides the findings of the international, quantitative and qualitative NanoCode survey about the European Code of Conduct for Responsible Nanosciences and Nanotechnologies Research (EU-CoC). The results summarised in this report give insights into stakeholder's patterns of awareness, their expectations, attitudes and appraisals. The survey analyses the degree of compliance and commitment, identifies recommendations for the communication, possible incentives, disincentives and monitoring of the EU-CoC. Nicknamed "SACLA" (SPring-8 Angstrom Compact Free Electron Laser), the new XFEL's intense beams will open a unique window onto the minuscule structure of molecules and rapid reaction of chemical species. Tyndall National Institute has began the coordination of a 3m euros EU project for the development of novel smart sensing materials for applications in water purification technology and clinical diagnostics. 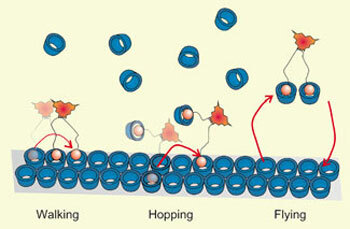 Are we only a hop, skip and jump away from controlled molecular motion? Controlling how molecules move on surfaces could be the key to more potent drugs that block the attachment of viruses to cells, and will also speed development of new materials for electronics and energy applications.